What God said through the prophet Isaiah long ago still stands today. He calls people who have strayed or who are wandering through life on their own, to come and reason with Him. God is calling us to a holy sit down with Him. He offers us help to come closer to Him. Then the choice is up to us. If we are willing, He will lead us into salvation from our sins, an eternal relationship with Him, and good in life. If we refuse, He will allow us to pursue life hell bent for an eternity without Him. The LORD now speaks in hopeful tones to His people. He speaks of their future and this implies they shall be restored and that God is not finished with His people. With the fall of the Northern Kingdom and the impending fall of the Southern Kingdom, things were looking bleak when Isaiah first delivered this message from God to the people. But even though there was some strong discipline in their future, there was also restoration as God has previously referred to in Isaiah 1. God is always looking to reconcile, to restore, to redeem. The words, “Now it shall come to pass in the latter days,” speaks of a time in the future from that immediate time in which God gave these words to Isaiah. This speaks about the coming Kingdom of King Jesus when He will reign a thousand years on earth, (i.e. The Millennial Reign). During this time the nations of the world will flock to “the mountain of the LORD’s house” which is Zion or the Temple Mount area in Jerusalem of our day. A time is coming when Jerusalem will be the center of the world’s focus. It is today, but for reasons of unrest and conflict. In the Millennium Jerusalem will be the central place of peace and contact with the LORD. As mentioned just before, “The mountain of the LORD” refers to Zion. “The house of the God of Jacob” implies a rebuilt Temple. That may be hard to envision in our day, but it’s going to happen, you can bet on it. As sure as Israel returned to the Promised Land and were reestablished as a nation, you can be sure that the Temple will be rebuilt. Really, it’s quite possible that there will be two Temples in our future. Without going into detail, there will likely be a Temple rebuilt during the Tribulation period that will be defiled by Antichrist (Daniel 9:24-27; 2 Thessalonians 2; Revelation 13). This defiled desecrated Tribulation Temple will likely be replaced by a Millennial Temple where Christ will reign on earth (cf. Revelation 11:1-2; Ezekiel 40-48). During the Millennium, this will be a place where people will seek to be taught of the LORD and receive instruction about holy living. God’s word will “go forth” from Jerusalem at this time. It will be a glorious time of holy enlightenment. Bur for us today, for right now, for the present time, I’d like to draw your attention to the words, “Come let us go up to the mountain of the LORD.” These words express the sentiment of society in general during the Millennium. Mountains are places of elevation where a person can get a better overall view of the geography of the surrounding areas. Because of that people associated mountains with places of insight and greater perspective. This was true of God’s people as well as pagan peoples. When I go to Israel one of my favorite places on earth is Mount Arabel which overlooks the Sea of Galilee. I love to go up to Arabel and walk over to the edge and just sit and be quiet in the presence of the Lord. There’s something about that elevated place which facilitates a consideration of the sacred. There’s something about that place that makes you feel closer to the Lord. It isn’t that heaven us “up” and hell is “down,” otherwise where would people be on the opposite of the planet? No, mountains and elevation are simply a way to illustrate getting closer to the spiritual realm, “gods”, or in the case of the LORD, to the One True God. Part of the sin of God’s wayward people that ultimately led to their defeat and captivity, was that they took their eyes off of the One True God, “the Holy One of Israel.” The word “holy” means separate and distinct. There is no God like “the Holy One of Israel.” In truth, there is no “God” but “the Holy One of Israel” (cf. Deuteronomy 32:39; 1 Kings 8:23; 2 Kings 5:15; 2 Chronicles 6:14; Isaiah 44:6; 45:5). The distinctive title “the Holy One of Israel” is found twenty-five times in the book of Isaiah (Isaiah 1:4; 5:19, 24; 10:20; 12:6; 17:7; 29:19; 30:11, 12, 15; 31:1; 37:23; 41:14, 16, 20; 43:3, 14; 45:11; 47:4; 48:17; 49:7; 54:5; 55:5; 60:9, 14). Truly, there is no “God” besides the “Holy One of Israel.” This is a high and holy truth. In the Bible, God seems to reveal truth and insight by using mountainous elevations. And such mountains illustrate certain “Mountains” which we as His people should make sure to go to. For instance, God gave His word to Moses on Mount Sinai (Exodus 19ff.). It was there that God met with Moses and gave His people His Law and in general a good portion of His word. We too need to ascend our Mount Sinai or the place where the Lord gives us His word. Have you been to your Mount Sinai? Go up such a mountain and God will provide you elevated understanding from His word. Another mountain for us to consider is Mount Pisgah. At Mount Pisgah the Lord brought Moses to an elevated viewpoint where he could see the Promised Land (Deuteronomy 34:1). Moses had been forbidden to lead the people into the Promised Land after he had misrepresented the Lord to the people (Numbers 20:11). But Pisgah is a place where, instead of relying on a worldview, we come to see the Land of our lives from a heavenly perspective. We need to ascend our Mount Pisgah to see our world through God’s eyes. Have you been to your Mount Pisgah? It was on Mount Carmel that Elijah challenged the pagan prophets of Baal (1 Kings 18). This challenge was the prophet’s instrument to call God’s people back to the One True God. That challenge involved calling on your “God” to reign down fire from heaven on a sacrifice. The pagan prophets of Baal railed and even cut themselves in flagellation meant to impress their god to reign down fire on the sacrifice. But all they got was silence. Baal is no God at all. One paraphrase of Elijah’s mocking of the impotence of Baal to the pagan prophets has the Prophet asking if their god is indisposed (on the toilet!). Ha! You have to love Elijah. But we too need to go to our Mount Carmel to call fire down. The fire we call for is the fire of the Holy Spirit; the baptism with the Holy Spirit, God’s promise to us (cf. Acts 1 and 2). John the Baptist tells us the Source of such fire is Jesus, “He will baptize you with the Holy Spirit and fire” (Matthew 3:11; Mark 1:8; Luke 3:16; Acts 2:33). Has God’s fire come down on you? Have you been to your Mount Carmel? While it is not completely agreed upon by commentators, it’s very likely Jesus was transfigured on Mount Hermon. Some believe Mount Hermon was the entry point of fallen angels into this world where they had sexual relations with the “daughters of men” (Genesis 6). Archeologists have found a high concentration of pagan temples in the Mount Hermon area. It is a place associated with pagan worship. Caesarea Philippi is where Peter declares Jesus the Christ and where Jesus said “on this rock I will build My church and the gates of hell will not prevail against it” (Matthew 16:18). Interestingly, followers of pagan gods came to call this area, “The gates of hell” or the “gates of Hades.” This title was connected to the foot of Mount Hermon where people believed a portal to the nether world of hell was located. In Jesus’ days the pagan god of Pan, the goat god, was worshipped there. Pan and its imagery is associated with satanic ritual. Jesus declaring that the gates of hell would not prevail against His church was an in your face declaration to the forces of darkness. But if Jesus chose Mount Hermon to be Transfigured (Matthew 17), it also was a way for Jesus to depict His true identity as well as make a statement that He was coming to get back what rightfully belonged to God. We too need to go to our Mount Hermon. We need to go to the Mount of our own transformation. We need to not only take in God’s word, have a heavenly perspective, and be fired up by the Spirit, we need to be transformed and grow in our walk with the Lord. We need to be transfigured. We should be able to do a personal spiritual inventory each year and see progress, spiritual growth. Have you been to Mount Hermon? Jesus taught of the End Times on the Mount of Olives. But more importantly, Jesus entered a Garden on the side of that Mount, the Garden of Gethsemane (Matthew 26). It was in Gethsemane where Jesus would go to pray. It was in Gethsemane where Jesus prayed fervently before going to the cross. It was in Gethsemane where Jesus taught us what prayer really is. It was there where He “offered up prayers and supplications, with vehement cries and tears to Him who was able to save Him from death and was heard because of His godly fear” (Hebrews 5:7). We need to go to our Mount of Olives, to our Gethsemane, and spend time with the Lord in prayer. Have you been to your Mount of Olives? Lastly, what is our incentive to ascend any of these mountains? Our incentive is seen in the last mountain of the Lord, Mount Calvary. 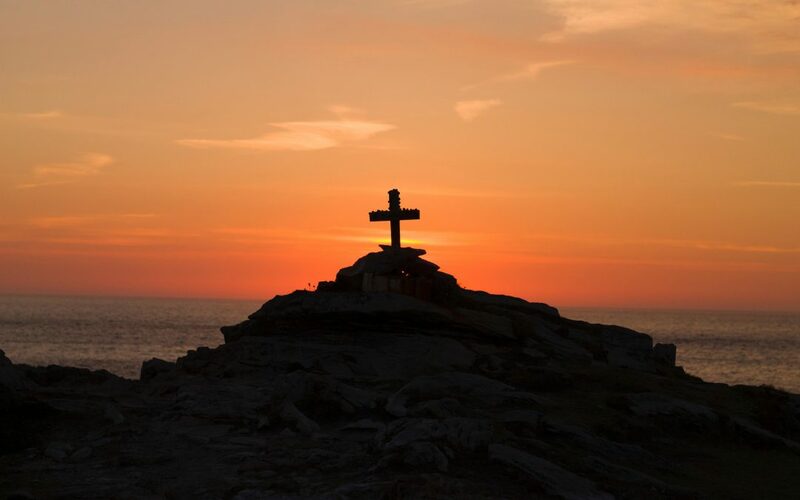 It was on Calvary that Jesus shed His blood and depicted in vivid detail and brutal honesty the extent, nature, and true meaning of His love for us (Romans 5:8). We look to Calvary and the cross and we know why we should ascend the other mountains. Jesus died so those other mountain overlooks would have meaning for us. In the famous book Pilgrims Progress, the main character “Christian,” begins life with a heaven-sent conviction that if he doesn’t get right with God he is headed for destruction. He embarks on a pilgrimage to find relief from his burden of sin and then on to the Celestial City where he will find that Jesus reigns. Along this journey he encounters all kinds of obstacles both human and geographical. Many try to distract him. Many try to dissuade and discourage him from going on. But there are helpers too; Evangelist and others. But it isn’t until Christian sees and looks upon the cross of Jesus that the burden of his sins fall from his back. In the same way, the first step to knowing God is to look to Jesus and His atoning work on the cross. The consequence of our sin is a curse; eternal death. Jesus became a curse for us that when we trust in Him, our sins could justly be forgiven and we could be spiritually enlivened; (e.g. Galatians 3:10-13; Romans 6:23). So, in this sense, Mount Calvary is the first mountain we need to encounter before we consider any other mountains. No one is saved by climbing mountains. We aren’t saved by our works (Galatians 2:16; Ephesians 2:1-9; Titus 3:4-7). We are saved by looking to Jesus; by looking at what He has done and accepting what the Bible says we can receive by faith; forgiveness for our sins and eternal life. Jesus said, “And I, if I am lifted up from the earth, will draw all peoples to Myself” (John 12:32). Jesus has climbed Mount Calvary for us. Jesus has done all the heavy lifting for us. He climbed Mount Calvary and planted the cross of our redemption on the top of it. Now all we need do to be saved and freed from our burden of sin is to look to Him in faith. Have you come to the foot of Mount Calvary and looked up to Jesus in faith? This is the most important mount. If you’ve truly looked with faith to Jesus on Mount Calvary, then your life will evidence a transformation. “Therefore, if anyone is in Christ, he is a new creation; old things have passed away; behold, all things have become new” (2 Corinthians 5:17). When we look to Jesus in faith, the burden of our sins falls off. And once this happens we find that Calvary also teaches us the key to life and following Jesus. “I have been crucified with Christ; it is no longer I who live, but Christ lives in me; and the life which I now live in the flesh I live by faith in the Son of God, who loved me and gave Himself for me” (e.g. Galatians 2:20). It’s at Calvary that we lay down our burdens. It’s at Calvary that we pick up our cross and follow Jesus (Luke 9:23). When we come to the mountains of the LORD, it doesn’t mean we sit back and casually take in the view. When we come to God’s mountains, there is climbing to do, and there will be danger at times. But trekking the mountains of God confirms every step of the way that Jesus is there; He is with us every step, on every ledge, to help us cross any crevasse or pass through any dark scary canyon.